Foosball also called as Table Football or Table Soccer is closely associated with football but the only difference that Foosball is played in a table. There are many brands of Foosball table available in the market. Garlando G 500 is one of the high end foosball tables. 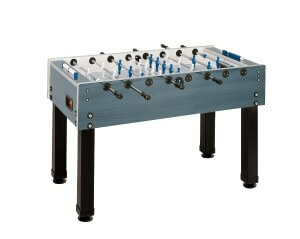 Garlando G 500 is the most popular Foosball table from Garlando. The looks of the Foosball table is very classy and elegant. The make is very mindful that it is designed to fit any room like regular furniture. 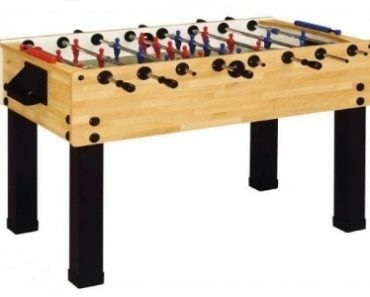 Overall, the Foosball table is of very strong and rigid, excellent stability and the comfortable playability make it the top selling Foosball table. Price: Check here for price! Check for more reviews here! The G 500 is made of high quality MDF material. It is very sturdy and durable and it is further strengthened by designing the table with a thickness of 1 inch. The durability and sturdiness of the table is dependent on how the thickness of the table is. If the table is thicker, then the durability and sturdiness is normally high. This sort of thicker table is usually judged as the higher end. The lower end table is usually half an inch thicker and is made of materials that are flimsy unlike the higher end quality tables which are made of higher quality materials. The best of the Garlando G 500 table is of 25 mm thick MDF cabinet with melamine coating. The player rods are made of Cold drawn steel rods and has a wall thickness of 2-3 mm. The surface finish of the rods is of high quality and as smooth as one can imagine. They are stronger and perfectly straight which allows very smooth game play. In order to increase the durability of the steel rods, the rods are plated with 5 microns of chromium. This eliminates rusting of the player rods. The player rods are also equipped with springs and plastic handles. These confirm high grip. These telescopic rods does not come on the other side and provide additional safety. This helps while small children playing the game, so that it does not anyone in the play which is very important. The Rods allows the player a very fast play which tends to make the game more interesting. The surface is made of tempered glass. This is not the normal table surface which you find in ordinary Foosball tables. It provides ultra smooth surface which enhances the gaming experience leaps and bounds. The metal legs are rigid and hence are not prone to any movement while in play. It is a fact that tables which moves a little or does not move at all provide very optimal playing conditions. The area of the metal legs is 9 x 9 square centimeters. This increases the competition level and the players on either side have the same scope of winning the play. The metal legs are further protected as it covered with washable powder varnish. The corners of the table are cornered. This keeps the ball in play at all times. So, the player would focus on the game without any second thoughts and each and every game has an interesting game play. The side panels are also perfectly curved. The wood handles are also designed to support a comfortable game play and reduces perspiration. Steel rollers are used with the custom designed rods which greatly enhance the game play and the speed of each game. Players do not hurt their wrists as the stress applied is reduced drastically. The ball bearing bushings are encased with Nylon. The players are guaranteed to be unbreakable. The Red and Blue players are molded on to the bars and made of perfect plastic with no pre determined breaking point. Other notable features include 360 degrees rotating goalie, very easy and immediate ball retrieval through and an exit behind each goal and a goal counter in Grey/White. The only drawback in this version of the table is that there are no leg levelers in this table, hence setting the correct height of the legs are somewhat hideous. But it is not a big deal unless you place the table on an uneven floor. It has unbreakable players which are not counter balanced. This result in some shots being blocked your own players. This is another drawback. It is best suited for teenagers, adults and intermediate players. It is built in such a way that the players can never go away once the play has started. It is also built keeping in mind the long time plays. The green tempered glass surface looks great and makes the table more attractive. The light wood cabinet has a very traditional look and goes in perfect sink with the black legs. Hence, this table is one Foosball table which was made with perfect mix of assets without compromising on quality. As per genuine reports, is by far the most sold free play table from Garlando since its appearance in 1997. 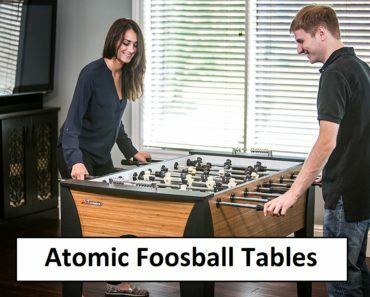 This table has received acknowledgements worldwide and has set its benchmark for all indoor foosball tables. This table complies with the harmonized European rules EN on safety. 10 Standard balls in white. Manual for easy assembly of legs, rods, players and other small parts. 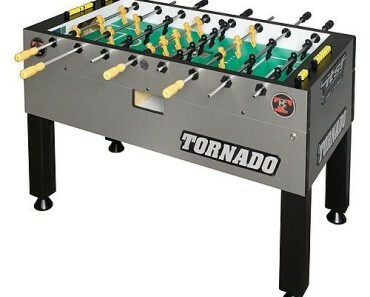 If you wish to invest in a strong and sturdy Foosball table that must last for a lifetime, then one needs to have a strong look at the Garlando G 500.